I recently reviewed recommendations for the optimal age to buy a life annuity and found that a number of sources recommend that men purchase in their mid-70s and women about six years later. Some of the recommendations could be traced back to a paper entitled, Annuitization and Asset Allocation , written by Moshe Milevsky and Virginia Young in 2007. You can find a link to the paper below in the References section, but be forewarned that it isn't for the mathematically faint of heart. The authors develop models for two annuity markets. 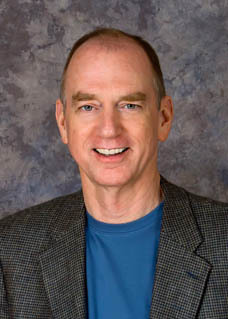 The first, referred to as “All or Nothing”, calculates an optimal age for purchasing a life annuity once in retirement. This single-purchase limitation might be the result of a retiree preferring to make a single annuity purchase, a pension plan that limits the participant to a single purchase, or a country's annuity market. The second analysis identifies an optimal way to purchase annuities when the retiree can choose to purchase any amount of annuity at any time. The authors refer to this strategy as “Anything Anytime” and it is the scenario in which most Americans will find themselves. In this post, I'll review All or Nothing and save the more complex Anything Anytime analysis for next time. For those of you who are not interested in the math, I provide a link to an Excel spreadsheet at Github in the References section below that does the heavy lifting for you. If you're even less interested in the math, skip down to the last five paragraphs beginning with "How can an individual use this information?" No one will know. where γ (gamma) is the coefficient of relative risk aversion, μ (mu) is the expected market return, σ (sigma) is the standard deviation of those returns and r is the risk-free rate. γ, the coefficient of relative risk aversion, is difficult to know for an individual but research shows that it is often between 1 and 2 for the typical investor. An investor with a high risk tolerance will have a low coefficient of risk aversion like γ=1. A more conservative but still typical investor might have risk aversion γ=2. An individual with a γ=5 has very low risk tolerance. A γ=1 retiree is far more likely to invest in the stock market than a γ=5 retiree. The equity risk premium is the excess return demanded by stock investors above the risk-free rate. When the market returns 9% and a risk-free bond returns 5%, the equity risk premium is 4%. It is the expected market return less the risk-free rate (μ - r in the equation above). This would simply mean that an investor could get a 5% return with no risk and that he might earn 4% more than that by taking on the risk of investing in stocks. Historically, the equity risk premium has ranged from about 3.5% to 5.5%. Think of M in the equation above as the return you expect from your investments (the term in square brackets) adjusted by your risk aversion (the term 1/(2γ) ). M considers not only your expectations of future market returns but also how much you value those returns based on your level of risk aversion. A risk-taker would value a 12% return, for example, more highly than a conservative investor would value that same 12% return. If your risk aversion is γ =1, meaning you're a typical risk-taker, then the hurdle you need to exceed to convince yourself to annuitize is one-half (1/2γ) your expected risk-adjusted market return, but if you're less of a risk-taker (γ =2), the hurdle is a much lower one-fourth of that return, meaning you will probably annuitize sooner than an investor with γ =1. When to purchase annuities with the All-or-Nothing strategy. People who expect higher returns on their investments and value those returns more (because risk bothers them less) will annuitize later in retirement than those who don't because they think they can do better investing than buying an annuity. They expect to do so well in the market that they won't need to annuitize as early. Some are so confident in their investment prowess that they won't buy an annuity ever. Retirees with lower market expectations and a higher aversion to risk will annuitize sooner. Some won't ever invest in the stock market. "One can then think of the hazard rate [force of mortality] as a form of excess return on the annuity due to the embedded mortality credits and the fact that liquid wealth reverts to the insurance company when the buyer of the annuity dies." While M quantifies how much the retiree values expected excess returns from her investment portfolio after adjusting for her risk aversion, the force of mortality quantifies how much he or she can expect as a similar “excess return” from an annuity. When the retiree values his expectation of investment returns equally with an annuity's excess return he has reached the optimal age to annuitize. Let me try to say all of this more simply. 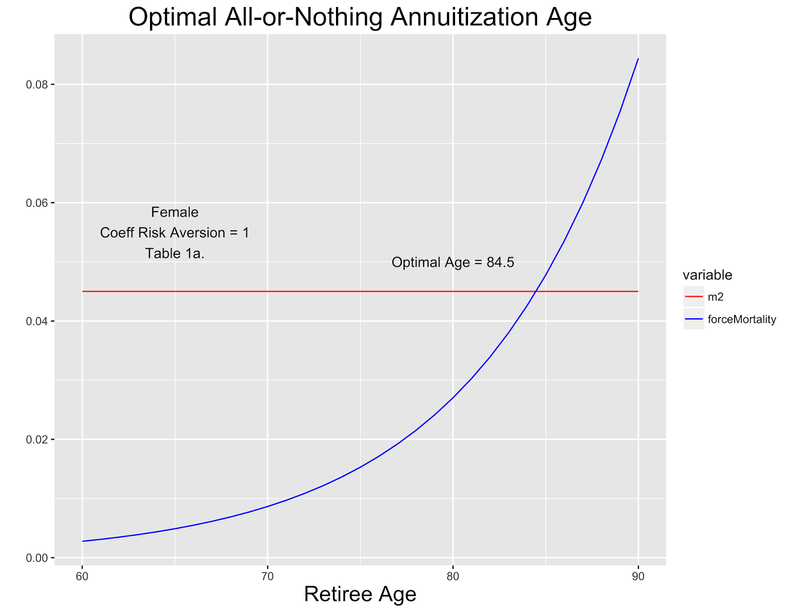 Milevsky  shows that the optimal age to buy an All-or-Nothing annuity is when the retiree values the return on an annuity the same as she values the return that she expects from her investments. In order to get a fair comparison, the paper uses the excess return on investments (expected return less the risk-free rate) to compare to the excess return on an annuity. Since some investors don't mind a lot of risk and some do, the excess return on investments is adjusted to reflect the risk tolerance of individual investors. (The annuity has no market risk.) And lastly, the excess return on an annuity is considered to equal the individual retiree's force of mortality, which is determined primarily by the retiree's gender and age. Force of mortality is the instantaneous probability of a person's death at a given age conditional upon reaching that age. It is the probability that a person who reaches the age of 75, for example, will die before his or her next birthday. You can play with force of mortality parameters a bit at the web page in References. The following graph shows the optimal age for the retiree used in the All-or-Nothing example in Milevsky , a female with risk-aversion coefficient λ=1. The tables that follow and include this example are taken from that paper. The optimal age to annuitize in the All-or-Nothing scenario occurs when the blue curve of the force of mortality for this individual crosses the “M” red line of the value of expected market returns (the hurdle). This intersection is the age at which the retiree expects to do as well purchasing an annuity as investing the same amount of money. Using these same inputs, Milevsky provides a range of examples in Tables 1a and 1b provided below for your convenience. Notice the column labeled “Value of Delay.” These entries show that the longer you wait before the optimal age the more value you receive from purchasing an annuity. Once you pass the optimal purchase age, delaying longer means an annuity would provide less value than an earlier purchase would have provided, but still more than the adjusted portfolio return (M). You can see this on the graph but the tables show only that the value of delaying becomes negative. How can an individual use this information for their own annuity purchase decision in an All-or-Nothing scenario? Economic studies are much better at teaching us how things work than at predicting outcomes for an individual household. The coefficient of risk aversion is difficult to tie down for an individual household and future market returns are at best a guess, so calculating an optimal annuitization age isn't nearly as exacting a process as these equations might seem to imply. So, what can we learn from playing around with these equations? The optimal age for annuitizing in the All-or-Nothing strategy is rarely much less than age 70 or much greater than 80 unless you are highly risk-averse, in which case you should simply ignore the math and buy an annuity early in retirement. Retirees who are less optimistic about future market returns will annuitize sooner. Play around with the spreadsheet to see how the parameters affect the optimal age to annuitize. Before you invest a lot of time in the All-or-Nothing analysis, though, Milevsky  follows it with an analysis of an “Anything Anytime” strategy in which the retiree buys some initial amount of annuity upon retiring and then buys more if and when wealth increases. This strategy better fits the U.S. annuities market and my instincts about retirement finance. See that analysis at Annuities: Anything Anytime. The math gets a lot harder, though. If Obamacare Exits, Some May Need to Rethink Early Retirement, New York Times, February 27, 2017. Annuitization and Asset Allocation, Moshe Milevsky and Virginia Young, 2007. 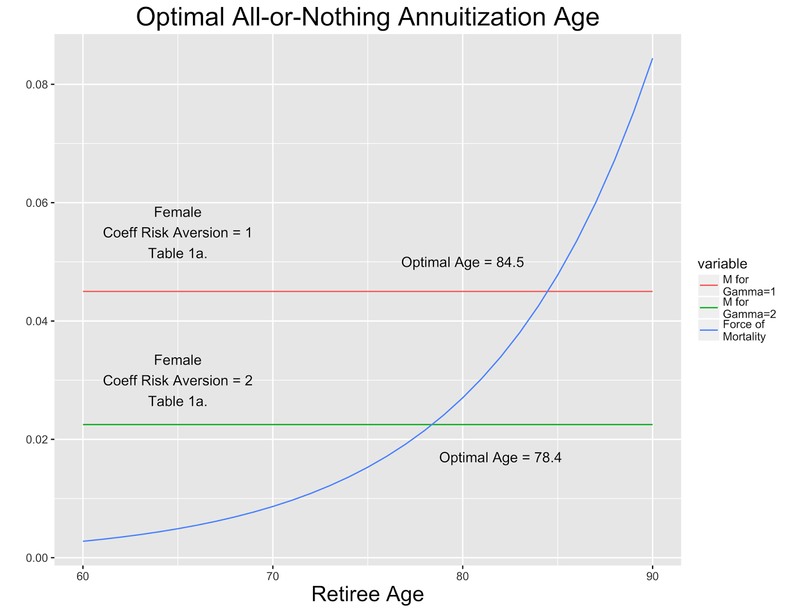 Download Excel spreadsheet to calculate the optimal age for annuitization in the All-or-Nothing model. The Gompertz function can estimate continuous life expectancy by fitting a curve to a discrete life expectancy table. The fit is achieved by manipulating the m and b terms. Milevsky  fits the curve to the Individual 2000 basic Annual Mortality table with projection scale G. For females m= 92.63 and b=8.78 and for males, m=88.18 and b=8.78 using this table. Force of mortality explained. It is analogous to hazard rate in reliability engineering. It is the probability, for example, that you will die at age 70 conditional upon your having lived to age 70. Understanding The Role Of Mortality Credits – Why Immediate Annuities Beat Bond Ladders For Retirement Income, Michael Kitces. Examples in this post and Milevsky  assume γ=1 or 2, μ=0.12, σ=0.20 and r= 0.06. Estimating the Coefficient of Relative Risk Aversion for Consumption from Gordon Irlam's AACalc website. I used to think along these lines. I planned to buy once my mortality rate was 1%. That would give me a return 25% higher than the (then) 4% Treasury rate. The annuity would replace my bonds, not the risky asset as modeled here .. but essentially the same concept. But notice how MM's model ignores the product pricing. How on earth can a purchase decision ignore that? What I have found comparing priced products for 60 and 70 yr old males, is that the sum of the mortality rate at each age, plus the interest rate presumed earned by the issuer (net of their costs) was about equal. As mortality rises, the interest rate earned falls. ... Possibly because of a rising yield curve. See the spreadsheet link for my identification. Canadian Treasury yields are 2.5% for long bonds and 1.8% for 10yrBonds -- a spread of 0.7%. The products' 60yrOld and 70yrOlds yields fell by the same 0.67% (2.24% - 1.567%). So while you gain mortality credits by waiting, you lose because the issuer is pricing in lower yields. They just about exactly offset. For the 60 yrOld, the sum of the yield plus mortality (1st yr) = 2.24% + 0.63% = 2.87%. For the 70 yrOld, the sum = 1.567% + 1.282% = 2.85%. Considering that a DIY portfolio of bonds would use a worst-case presumption of living to 100 and buy the long bonds with the higher yields, the incentive to delay purchase disappears. Ignore all the stuff about Prescribed Annuities. That is a Canadian thing. The basic immediate-pay product would be the "Non-Prescribed"
Milevsky's analysis compares the rate of return of the market to the "rate of return" of an annuity (mortality credits). Because rate of return essentially normalizes pricing the product price itself becomes irrelevant. If Ford and GM stocks are both expected to return 5%, we can compare their expected performance even if the price per share for the two stocks is different. If I know the expected return, I don't care about the price. Sorry, just realized I didn't address your second issue. "Considering that a DIY portfolio of bonds would use a worst-case presumption of living to 100 and buy the long bonds with the higher yields, the incentive to delay purchase disappears." Purchasing long bonds to fund every year of retirement would indeed provide the highest yield, but also the greatest volatility. That would be a risky strategy. A more reasonable strategy would be to match bond duration to expense duration in which case the retiree would face the same yield curve as the annuity provider. Thanks for putting this together. Why isn't the amount that the annuity pays (% of purchase) a variable? Or, did I miss that? Charlie, see the explanation above. Milevsky is comparing rates of return so the price has effectively been normalized. You never need to blog in HTML. Blogger.com, for instance, has a WYSIWYG editor. There are third-party WYSIWIG editors if your blog server doesn't offer one. I prefer to write in markdown and use the markdown editor to generate the HTML. If you're just getting started, start with a platform like blogger.com that provides a WYSIWYG editor. You can add HTML chops later, if you so desire.